Epoprostenol in the ED--Go with the Flolan? It’s the middle of one of the worst influenza seasons on record, and your hospital is packed to the gills. The private physician dining area of the cafeteria has been repurposed to treat patients. Every ICU bed is taken, and there are fourteen patients boarding in the ED while waiting on an ICU bed. Your early working diagnosis is that this patient is septic, likely from an intra-abdominal source. Her bedside cardiac ultrasound shows hyperdynamic ventricular function, with under-filled ventricles. 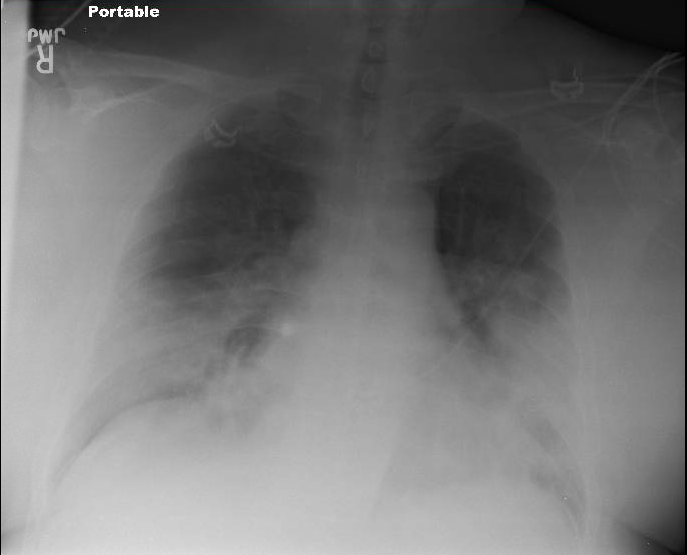 Your interpretation of her chest x-ray is: bilateral alveolar infiltrates; this xray, along with the hypoxia and preserved cardiac function means your patient has acute respiratory distress syndrome (ARDS). Because of the hypoxia while on non-rebreather, you pre-oxygenate the patient with non-invasive ventilation (BiPap settings: 18/10 with FiO2 1.0) and flush-rate nasal cannula. After intubation, she initially improves and her SpO2 improves to 98%. You put in orders to maintain her on lung-protective ventilator settings, deeply sedated to a RASS of -4, and get back to the grind. A few minutes later, the respiratory therapist tells you she’s having trouble maintaining the SpO2 above 90% on a FiO2 of 1.0. The RT has attempted alveolar recruitment with PEEP, but still no improvement. You think back to your last month in the ICU, when you managed several patients with ARDS, and wonder if you should start an inhaled prostacyclin. ARDS is an inflammatory syndrome resulting in primarily non-hydrostatic, high-protein pulmonary edema. Following an inciting event (e.g. sepsis, trauma, inhalation injury, etc. ), injury to the alveolar epithelium and capillary endothelium result in “leaky lungs”, and the resultant pulmonary edema, inflammation, and alveolar coagulation abnormalities, result in hypoxemia, and a situation of increased shunt and dead space. The treatment of ARDS is largely supportive. Goals related to the mechanical ventilator should be to limit the potential for ventilator-associated lung injury while maintaining adequate enough oxygenation and ventilation. Tidal volume should be set around 6ml/kg predicted body weight (lower if plateau pressure goal exceeded, higher if hypercapnia results in life-threatening acidosis). There is no consensus on how to best set PEEP, but PEEP is increased for alveolar recruitment. Plateau pressure should be limited to <30 cmH2O, with an oxygenation goal of PaO2 55-80mmHg. (for this handy vent management card, check out http://www.ardsnet.org/tools.shtml ). Other physiologically sound and evidence-based treatment options include neuromuscular blockade and prone positioning, as demonstrated in the ACURASYS and PROSEVA trials. When hypoxemia persists despite appropriate ventilator settings, neuromuscular blockade, and prone positioning, another treatment option to improve perfusion to ventilated alveolar units is the use of inhaled pulmonary vasodilators, such as epoprostenol. Epoprostenol, a prostacyclin also known as Flolan, vasodilates the pulmonary capillaries around ventilated alveoli, thus reducing shunt. It also suppresses the production of several pro-inflammatory cytokines, and may increase surfactant production. When used as an infusion, it creates a substantially decreased systemic vascular resistance, as Bihari et al discovered in 1987. However, when inhaled at lower doses, prostaglandins selectively vasodilate the pulmonary vasculature with fewer effects on systemic pressure. In clinical trials by Walmrath and Zwissler, aerosolized PGI2 reduced the pulmonary artery pressure and increased oxygenation. Zwissler also found that inhaled epoprostenol produced the same reduction in pulmonary vascular resistance and increase in PaO2 at 10ng/kg/min as it did at 25ng/kg/min. Van Heerden’s clinical trial found the greatest increase in oxygenation occurred between 0-10ng/kg/min, without significant improvements at higher concentrations. Inhaled nitric oxide has similar effects, reducing pulmonary vascular resistance and increasing PaO2 without a detrimental effect on systemic circulatory pressures or cardiac output. However, at higher concentrations, it theoretically induces the formation of methemoglobin, and generally costs an arm and a leg. De Wet and colleagues found that the average cost for Flolan was ~$150/day while inhaled Nitric Oxide was in the neighborhood of $3000/day. So where’s the rub with inhaled prostacyclins? The take away is that they will improve oxygenation and reduce pulmonary artery pressures, but there is VERY little outcome data to support inhaled epoprostenol use in ARDS (certainly it does not support its routine use). As Fuller et al discovered, the research that exists on inhaled prostacyclins is sparse. The results of these many RCTs are pretty heterogenous, many of them do not compare the results of iEPO to placebo, and few if any demonstrate a clinical outcome benefit. Even in patients with pulmonary arterial hypertension leading to hypoxemia in the ICU, the survival benefit of inhaled prostacyclins is unknown. Coming back to our ARDS patient, her oxygenation improved significantly with bag and suction, during which RT was able to remove copious secretions. We performed similar lung recruitment measures every few hours and got our patient into an ICU after a twelve-hour board in the ED. Bihari, D., Smithies, M., Gimson, A., & Tinker, J. (1987). The effects of vasodilation with prostacyclin on oxygen delivery and uptake in critically ill patients. New England Journal of Medicine, 317(7), 397-403. Charl, J., Affleck, D. G., Jacobsohn, E., Avidan, M. S., Tymkew, H., Hill, L. L., ... & Smith, J. R. (2004). Inhaled prostacyclin is safe, effective, and affordable in patients with pulmonary hypertension, right heart dysfunction, and refractory hypoxemia after cardiothoracic surgery. The Journal of thoracic and cardiovascular surgery, 127(4), 1058-1067. Fuller, B. M., Mohr, N. M., Skrupky, L., Fowler, S., Kollef, M. H., & Carpenter, C. R. (2015). The use of inhaled prostaglandins in patients with ARDS. Chest, 147(6), 1510-1522. Guérin, C., Reignier, J., Richard, J. C., Beuret, P., Gacouin, A., Boulain, T., ... & Clavel, M. (2013). Prone positioning in severe acute respiratory distress syndrome. The New England journal of medicine, 368(23), 2159. Kaisers, U., Busch, T., Deja, M., Donaubauer, B., & Falke, K. J. (2003). Selective pulmonary vasodilation in acute respiratory distress syndrome. 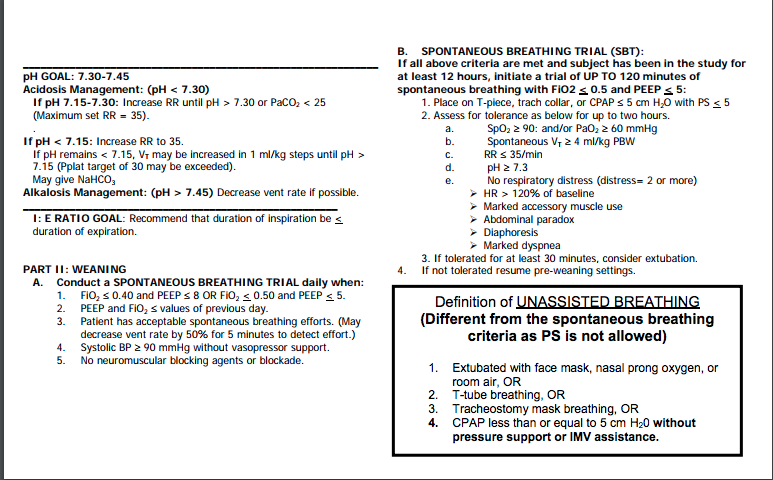 Critical care medicine, 31(4), S337-S342. Lee, K. (2017). The neuroICU book. McGraw Hill Professional. NHLBI ARDS network. http://www.ardsnet.org/. Updated 2014. Papazian, L., Forel, J. M., Gacouin, A., Penot-Ragon, C., Perrin, G., Loundou, A., ... & Constantin, J. M. (2010). Neuromuscular blockers in early acute respiratory distress syndrome. N Engl J Med, 363(12), 1107-1116. Searcy, R. J., Morales, J. R., Ferreira, J. A., & Johnson, D. W. (2015). The role of inhaled prostacyclin in treating acute respiratory distress syndrome. Therapeutic advances in respiratory disease, 9(6), 302-312.
van Heerden, P. V., Barden, A., Michalopoulos, N., Bulsara, M. K., & Roberts, B. L. (2000). Dose-response to inhaled aerosolized prostacyclin for hypoxemia due to ARDS. Chest, 117(3), 819-827. Walmrath, D., Schneider, T., Schermuly, R., Olschewski, H., Grimminger, F., & Seeger, W. (1996). Direct comparison of inhaled nitric oxide and aerosolized prostacyclin in acute respiratory distress syndrome. American journal of respiratory and critical care medicine, 153(3), 991-996. Zwissler, B., Kemming, G., Habler, O., Kleen, M., Merkel, M., Haller, M., ... & Peter, K. (1996). Inhaled prostacyclin (PGI2) versus inhaled nitric oxide in adult respiratory distress syndrome. American journal of respiratory and critical care medicine, 154(6), 1671-1677.